themselves by jumping into the river, while shooting at chest, back and ribs. But the injured activist Hafez Rashedul Islam, who was drowned in the water, said he was not injured. Fifth among seven children of father Maulana Anwarul Haque and mother Saleha Begum. Shahin's house in village Andrbaria of Jibanagar thana of Chuadanga district. 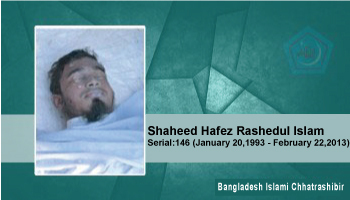 Place of martyrdom: He jumped into the Padma river to save his life from the police. He lost his consciousness, and an oar was used to sink him and drown him to death. He jumped into the Padma river to save his life from the police. He lost his consciousness, and an oar was used to sink him and drown him to death.